The latest report from the WSTA showing full year 2017 as well as Christmas 2017 sales figures shows that inflation and ever rising price increases pushed total yearly alcohol sales for the off-trade up by £580m compared to 2016. This also accounted for an extra £120m worth of sales for Q4 2017 (October to December) compared to the same period the year before. While volume for total alcohol dipped by 1% in 2017, value rose 4%, with average prices rising alongside. With inflation and price rises biting down last year, the figures show that still wine’s average yearly price per 75cl bottle is now £5.64 (+ 8p on last quarter’s numbers), and it is this £5-£6 price bracket which continues to see the most significant growth. In the 12 months to December 31, wines retailing for between £5 and £6 rose 8% in both volume and value, the equivalent of 1.81 million bottles worth £1.35bn in 2017. With the exception of the £9-£10 bracket, all price points above £6 posted double digit volume and value growth, accounting for 30% of all volume wine sales. This is in contrast to 2012, when wines over £6 by volume accounted for just 14% of sales. 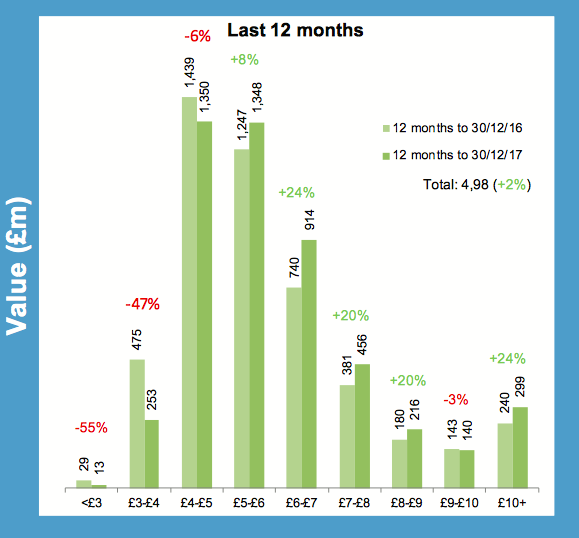 All sub £5 price points were in negative growth – the same for volume and value figures. Sparkling meanwhile continues to lead the pack when it comes to wine growth. Although sparkling stalled slightly compared to the previous quarter, a trend that continues from Q2 2017, it remains a leading category for growth, particularly by value. The WSTA report also noted that there has been a noticeable increase in average prices - something “which hasn’t always been present in sparkling wine, as value sales start to outpace volume sales”. Sparkling wine rose 6% in volume and 9% value and was worth £851m compared to still wine’s £5.3bn in 2017. Still wine saw a slight dip in volume (-1%) throughout the year while value was up by 2%. Similar trends were at work in the on-trade, where average prices continue to rise. In the UK’s bars and restaurants, the decline of still wine sales was arrested slightly with the help of sparkling wine, which shaved around 2% off of the decline of total wine sales. Growth of sparkling is far outpacing the off-trade however. Although starting from a lower base, on-trade sparkling sales rocketed 23% in both volume and value, worth £529 in 2017.